Built in 1909 by Herbert Porter, the terrace house was home to the Porter family until 1997. It was left to the National Trust by Miss Hazel Porter, with its contents intact, providing today’s visitors with a vivid experience of early to mid-twentieth century inner-city life in Newcastle. 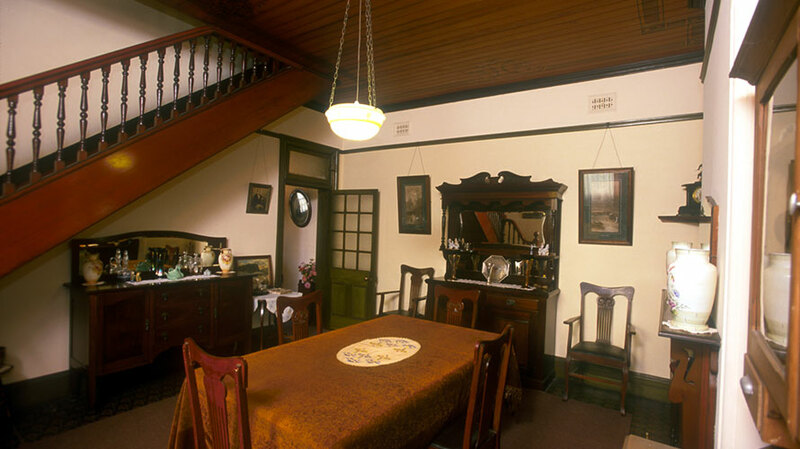 Miss Porter’s House is filled with 1909-1940 furnishings and personal items which tell the story of the family over more than a century. Herbert Porter and his bride Florence Jolley moved into their new home in 1910. A gate in their backyard led to James Porter’s grocery store and it was from the accompanying yard and stables that James’ son Herbert conducted his carrier business. The young couple soon started a family, Ella was born in 1911 and Hazel in 1914. Sadly, Herbert fell victim to the influenza epidemic of 1919 and Florence was left to raise the two girls alone. The house, grounds, interiors and contents are intact, and the property was continuously occupied by the Porter family for nearly ninety years. Australia Day and the second Sunday of every month (February to December).